“Civility” For Thee, But Not For Me? A Bucks County Republican candidate for the 8th Congressional District came out vehemently against a rival’s call to sign a civility pledge for the duration of the campaign. Fellow GOP candidate Brian Fitzpatrick issued the pledge to campaigns on both sides last week, amid controversy over a parody website and accusations of Hatch Act violations. “It’s more difficult to build [roads] in Bucks because if Newtown says it’s Wednesday, Lower Makefield says, “No, it’s not. It’s the day before Thursday,” said Warren. “And you can substitute any two municipalities in Bucks for Newtown and Lower Makefield.” …. “You don’t have that in places like Lackawanna County,” Warren said. Yep, ol’ Andy is prone to what you might call the “incendiary quote” himself from time to time; he may be technically right about not insulting other candidates, but he’s not exactly acting in accordance with Emily Post here, either (you can Google it). And I never did find out what is behind his apparent preference for Lackawanna County. 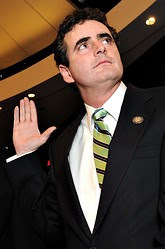 Returning to the story…in typical fashion, the Courier Times mentions possible Hatch Act violations committed on Brian Fitzpatrick’s behalf, but fails to point out that the possible violations were carried out by none other than Brian’s brother, our departing wet noodle rep himself, “Mikey the Beloved” Fitzpatrick. Last year, long after GOP Rep. Mike Fitzpatrick announced he would retire, the Philadelphia-area representative began calling Republicans in his district to pitch them on a perfect successor: his brother. But Brian Fitzpatrick, a FBI agent and Mike’s younger sibling, was still working as a federal law enforcement official when the calls began, according to two sources with knowledge of Mike Fitzpatrick’s efforts, one of whom received a call personally. That could prove a problem: The below-the-radar persuasion campaign may have violated a law that prohibits federal employees, or surrogates acting on their behalf, from running for partisan office or making preparations to do so. Only a couple weeks after his campaign launch, Brian Fitzpatrick drove another leading GOP contender out of the race. He secured the endorsement of the local Republican Party soon after, as the field cleared. But a campaign law expert says his brother’s legwork beforehand may have run afoul of the Hatch Act — specifically the part which forbids federal employees from even “preliminary activities regarding candidacy,” including preparation by proxies. So am I the only one out there who thinks this whole “civility” thing is nothing but a ruse to try and deflect attention from the Hatch Act issue? Oh, and for the record, the parody web site aimed at Brian Fitzpatrick and linked to the Steve Santarsiero campaign is small potatoes by comparison when you consider this that was perpetrated by Brian’s brother (or, at a minimum, Mikey’s NRCC supporters without a word of reprimand against them) in 2012. You are currently browsing the The Liberal Doomsayer blog archives for March, 2016.